What a result this one has been…..! but also, what a journey. I have been working with these clients for around a year now but they have been attempting to get planning on land within their garden for a number of years and unfortunately for them, this has been unsuccesful. The characteristics of the plot and their project are probably the most difficult we encounter. The land is within the curtilage of their Grade II listed house, set within the village Conservation Area and furthermore, the land is designated as PVAA (protected village amenity area), ie. you cant build on it! So, as you can imagine, the prospect of designing this scheme and obtaining planning permission would be pretty much mission impossible…. well, as of tonight, we beat the system and planning was in fact approved with no amendments! There is a massive back story to this project and any amount of blogging would barely scratch the surface but in a nutshell, we approached this scheme in our sometimes unorthodox approach and went for it on behalf of our clients and to say they are pleased is a massive understatement. With the NEC Homebuilding and Renovating Show now behind us, we can reflect on the launch of Oakwrights by Design amongst other things…. 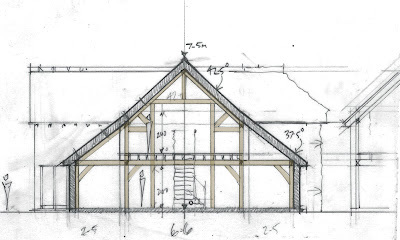 You would be amazed at the number of people who want to create an individual oak framed house but then look to commission an architect or designer who have no experience in this complex form of construction. I have been working with the Oakwrights team since 2003/2004 and of course have since done many projects between us but even ourselves are constantly learning how rewarding these structures can be, although saying that, Oakwrights are absolutely at the top of their game right now and are able to deliver something rather special. This combined knowledge sees the release of Oakwrights by Design which introduces formally the team behind the creation of what i feel to be some of the best houses out there right now. These are Darren Blackwell, John Williams and myself. All three of us work closely with the whole team at Oakwrights and undertake concept, design and planning together with building regulations, project management and full build solutions. Check out the portfolios on the Oakwrights website and remember, you can approach us at any stage of your project including site appraisals, feasibilities etc. We find that projects that have involved us from inception result in much better designs and simpler build processes and therefore are more cost effective. 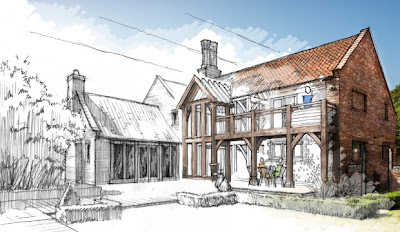 So, i finished my concept designs for the new farmhouse project in Lincolnshire yesterday afternoon and emailed them up to the client. The very special relationship i share with my clients is based on me getting into their heads and understanding what it it they are trying to achieve. They often underestimate their capabilities as designers which is understandable but they do have the core data that is required to create the initial concept and i am involved to then facilitate its creation. This project is looking great already and as always, i design my clients houses as if they were my own and therefore i always aim for the best. Nice to get this reaction as always and i will update on the planning process as we go through it.